This lovely waterfall is situated close to a little town known as Punduluoya. To reach here, I traveled from Thalawakele to Thavalamthenne (New Kothmale Town) and turned towards Dunsinane Estate after Punduluoya. For some reason I liked the long name of the waterfall and wanted to visit this place. Usually long names are customary in Sri Lanka. There is another estate known as Sheen Estate in the same area. So may be it was named after both estates. The fall has two sections – above the road and below the road. The combination of two waterfalls creates one of the most spectacular sceneries in Sri Lanka. The waterfall must be very fierce during monsoon seasons. That is one of the coolest waterfall scenes, i've seen. Was this a natural waterfall, that they built around - and perhaps tweaked a little, or is this manmade? Also, is that a structure in the top left of the photo? It looks interesting. oh, this is beautiful, with a bridge in between the two cascades, and the house right there must be enjoying all the sounds. That is one amazing waterfall.... I'm sure that has to be one of the most spectacular sceneries in Sri Lanka... Can you feel the mist while on that road????? Oh my! What a gorgeous waterfall. Yes, it has more water during rainy periods. The waterfall is natural and I doubt there is any change done to the flow. But a road is built over the falls and a few buildings are built up near the falls. Yes that is actually a hindu temple. Yes, we were actually standing on the bridge and there was quite a mist across the bridge. It was an excellent place. I have a very good friend of mine, also Chavie's good friend who lived in Sheen estate long time ago. Their bungalow had a gorgeous pool also. Thanks again for the wonderful vistas you bring us. This is a very magnificent waterfall. You've shown several spectacular waterfalls in Sri Lanka -- you're making me want to visit there. That is an excellent and unusual waterfall, very beautiful. Your photo captures it perfectly. that waterfall is stunning. but, i'd worry about the hindu temple during flooding season. maybe it appears to be closer to the water than it really is. hope all is well. i think this is the one i commented about on your Ravana post. What a magnificent waterfall. The lower section looks like a lady's long tresses. Thanks for visiting and your nice comments. How nice that you were able to get far enough away to show both sections in one shot. I mention this because just recently I tried to take a similar shot...and could not. The road upto this point is well developed because of the Uppre Kothmale power plant just opposite the falls. I think I came here when it had quite a lot of water but it will get better during rainy days. Yes it is not the typical waterfall you’ll see quite often. It is a quite special one for me. You have a fair point there. But the main temple is quite safe throughout the year as per my knowledge. I remember your comment and I also not very sure about this waterfall as I had not visited here then. 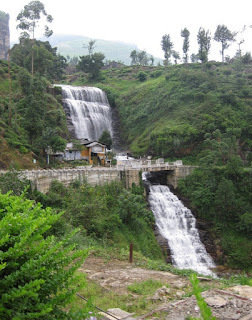 That is why I thought you might have mentioned about Ramboda Falls, which can be seen from A5 route. I had to go quite far to get this shot from the bridge. Unfortunately the best viewing point is now not accessible due to ongoing hydro power project just in front of the falls. What a beauty! That bridge gives it a unique look. There are many places that are not major tourist attractions yet but deserve to be so in our country,right? Yes, agree. There are hundreds of less popular places in SL, which have the splendour to be major tourist attractions. Wow! Breathtakingly gorgeous. Your photo captures the magic of this wondrous place. Stunning! Thank you so much for sharing. Nice photo...its my first time to see such falls...thanks! Yes this area is quite exotic! We have a few similar waterfalls in Sri Lanka. I'll bring them as well on another time. love this place. been here twice. theres a small kovil adjoning this if i'm not mistaken. further into ths estate where it borders the jungle there is a log cabin managed by aitken spence. its built on the bank of a creek/stream where you can walk down the steps into the water and there are 3 smaller waterfalls in a sorta triangle. you can swim there and when you trek for a coupla hours along the water you come down to this waterfall. one of the most beautiful places i've ever been to in SL. Great to hear you have been here! I think I have heard about the hotel you mentioned. Your description makes me go there much quicker than I thought of.